So just want to share the lightening turn around time on this recipe. I came home from work today (Thursday, Nov 29th) with an urge to make a new recipe. Problem was it was already dark out so that means quite a difficult time trying to get a good photo, plus bed time was quickly approaching. 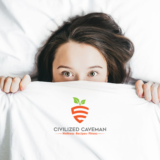 We all know that old caveman like myself need plenty of beauty sleep, so that is always my priority. Well anyways, I whipped this recipe up in 5 minutes with the most amazing dates I have ever had thank you to my local farmers market. These things were so juicy and succulent, I could only eat two before I had to stop. That says a lot coming from a self professed date addict. Back to the turn around time since my obvious ADD kicked in. Once I made them and realized their photo potential I went to town trying to get an amazing photo. I got some keepers and decided to type this recipe tonight and post first thing in the morning so you could all have a weekend treat. And if you want to see the effort I put in, my camera was on a tripod so high I needed a stool to change settings. Mainly because I am short, but also cause it was high. You can check it out and follow me on Instagram. I just checked out the clock and I have 31 minutes to finish this post before I turn into a pumpkin if I am not in bed. So forgive my brevity, that is of course unless you prefer not to read my rambling. So a few quick things before I go. I have a giveaway going on right now and running until Dec 9, 2012, so go enter HERE. And don't forget you earn extra entries everyday by sharing. Second thing, I hope you all had an amazing Thanksgiving and scored some good deals on Black Friday or Cyber Monday. If you purchased my ebook, thank you so much. Your support is so humbling, but the only words I can muster are Thank you. Finally, I have a few good posts lined up for the next week. I will be giving you a giant recipe round up for Christmas as well as a stocking stuffer/christmas gift idea post on what I think everyone needs for Christmas. Even if it only helps one of you, it is totally worth it. Speaking of help, you can all help me keep this website awesome and off set some of the costs by doing your Amazon shopping through any of my links, just like this one to the HOMEPAGE. I always thought websites were free, boy was I WRONG. Anyways, just shopping through that link helps me as Amazon pays me like 5% of your sale without costing you a thing, so thank you if you use it. Oh and I almost forgot, starting with the New Year, I will be sending out exclusive content only to people that are on my mailing list. This includes discounts on my ebook, tshirts, and anything else I can discount for you as well as TOP SECRET recipes. You can subscribe by clicking the link on the top of my page, or the orange box on the right with my Caveman. Can't wait to share with you. This is just a base for many different variations. You can substitute different nuts or seasonings to your taste. If you do, post it in the comments and I will add the variations to the recipe. These are fantastic , I have a batch in the fridge as I speak! This looks delicious! I have everything I need to make it EXCEPT the vanilla beans- but I have vanilla extract. Is there any way I could substitute, or not really? Hi i from turkey and i dont know how much 1 cup makes how many gr ? could i use prunes you think? It just so happens that I have all of the ingredients I need to make these right now! Too bad I have mono, and I feel like I’m dying so I should really be in bed. On a much nicer note, I’m thoroughly impressed with your night time photography skills! I couldn’t do it without getting frustrated! Do you use incandescent bulbs or CFLs? Looks like a fantastic for my old favorite homemade candy recipe. It involved butter and copious quantities of powdered whole milk. This should be much better for my blood sugar levels! Made a variation with macadamia nuts and pecans. Then dipped on dark chocolate made with unsweetened dark chocolate, coconut oil and coconut butter. This recipe is great! I’ve been on a chocolate kick and these looked so simple I had to make them right away. I used cashews in place of the almonds and a splash of vanilla in place of the beans, but they were still yummy. I bet they’d be even better with fresh vanilla. Thank you George!